Let’s start our exploration of the musical genres of South and Central Asia by touching upon the music of Central Asia, which developed over several thousand years during which the region, though almost all landlocked and almost impenetrably vast, was a literal crossroads for merchants, travelers and rampaging marauders. 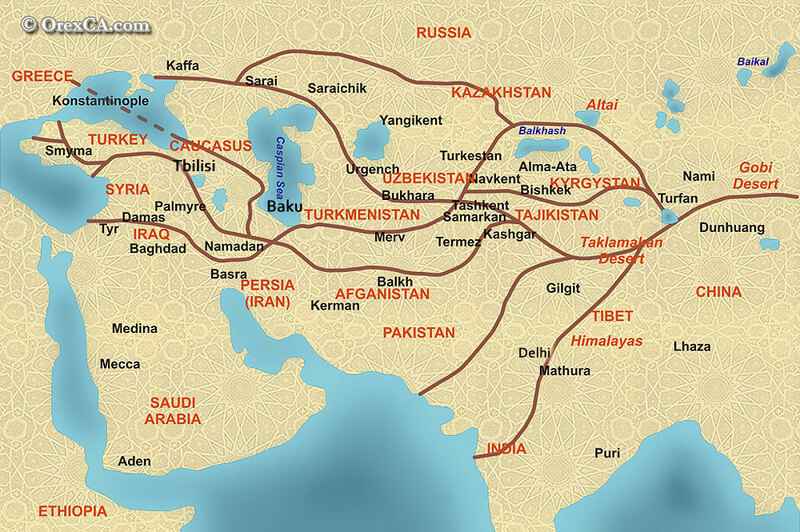 The Silk Road was a network of trade routes that crisscrossed the region, ultimately connecting China with the West. (Get your bearings: a map of the Silk Road.) This jumbling of people and purposes led Central Asian music to develop fluidly, placing great value on diversity. — SHASH MAQAM (six maqams), which flourished in the historically multicultural cities of Bukhara and Samarkand, and whose performers and audiences included Tajiks, Uzbeks, and Central Asian (“Bukharan”) Jews. Listen to a shash maqam on YouTube, and make sure to look at the description of the video for a history of the shash maqam. If you want to delve deep music from the region and happen to find some extra change in your couch cushions you should get your hands on the nine volume Smithsonian Folkways set, “Music of Central Asia”, which will introduce you to Tengir-Too from the mountains of Kyrgyzstan, Homayun Sakhi, master of the Afghan Rubab and, of course, Bardic Divas. Woo hoo! You should also open your ears to The Silk Road Ensemble, an extraordinary collection of Central Asian musicians that came together with the inspiration of cellist Yo Yo Ma. We have to go only slightly south from Central Asian countries like Afghanistan to end up in Pakistan and then India, a fact that’s actually essential to understanding the different between two primary genres of South Asian classical music. North Indian (Hindustani) and South Indian (Carnatic) musics are both based upon many similar concepts but are also as fundamentally different as the North and South Indian cultures from which they arise. The most common and most simplistic (though not altogether untrue) explanation for the difference between Hindustani and Carnatic musics is that historically Northern India has had more cultural interchanges with Central Asian peoples, especially with Muslims, than has the South. When Northern Indian music developed in the 13th and 14th centuries it did so hand in hand with the Islamic-inspired musics of Afghanistan and Persia. South Indian music rose in the 15th and 16th centuries in relative isolation. Both Hindustani and Carnatic compositions twist and turn and can come across as labyrinthine, but at the heart each relies on two basic concepts: rag, the way a melody develops from note to note, and tal, a composition’s rhythm. Since we introduced maqam as a melodic concept above let’s dig a bit into the rhythmic essence of taal. Thanks to WorldMusicGuru.com for most of the above YouTube demonstrations of the tala.